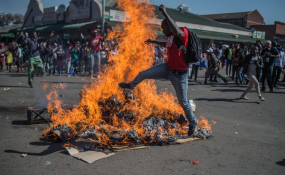 MDC supporters protested in Harare on Wednesday after the electoral commission announced that Zimbabwe’s ruling party had won a majority of seats in Parliament and the country braced itself for the first official results of the presidential election. POLICE have confirmed that three people died as violence rocked Harare Wednesday afternoon after results of Monday's elections showed that the ruling Zanu PF party had won the parliamentary vote. ZRP spokesperson Charity Charamba confirmed the fatalities Wednesday evening while also revealing that police were keen to interview MDC Alliance leaders Tendai Biti and Happison Chidziva in connection with the violence. Dozens of suspected MDC Alliance supporters streamed into the city centre after the parliamentary result was confirmed with some trying to storm the Zimbabwe Electoral Commission (ZEC) Harare head offices as well as the elections command centre at Rainbow Towers hotel. Riot police and the military then moved in to disperse the crowds with the latter reportedly firing live ammunition at the protestors. Charamba said police had yet to identify the three people who died in the clashes and urged members of the public to desist from being coerced into committing acts of violence and vandalism.